Yep, that’s right—Utah takes the cake in this one; that delicious, but oh so balanced cake. Keep reading to find out why Utah, and the rest of our 10 winners, made the cut. When it comes to work-life balance, there are some key characteristics that apply, no matter where in the country you live. Those two key ingredients (I can’t seem to stop thinking about that cake now…) are, of course, happiness and satisfaction. Unemployment numbers reflect the preliminary data from the BLS for February 2016. Religion data taken from the 2010 Religion Census. Basically, if you don’t waste time getting to and from work, work fewer hours per week, and have a family, you’re on the road to work-life balance. Of course, it’s also important that there are things to do and that the people who do want to work can actually work. Plus, it’s always nice to have some sort of higher purpose. So with these things in mind, we included the population density as a proxy for things to do, the unemployment rate, and percentage of people that are adherents to a religion. We then ranked each place from one to 50 (for each state) in each criterion, with one being the best in any given category. Finally, we took the average rank across all criteria, where the state with the lowest score was crowned our “Best State for Work-Life Balance.” Here’s lookin’ at you, Utah. 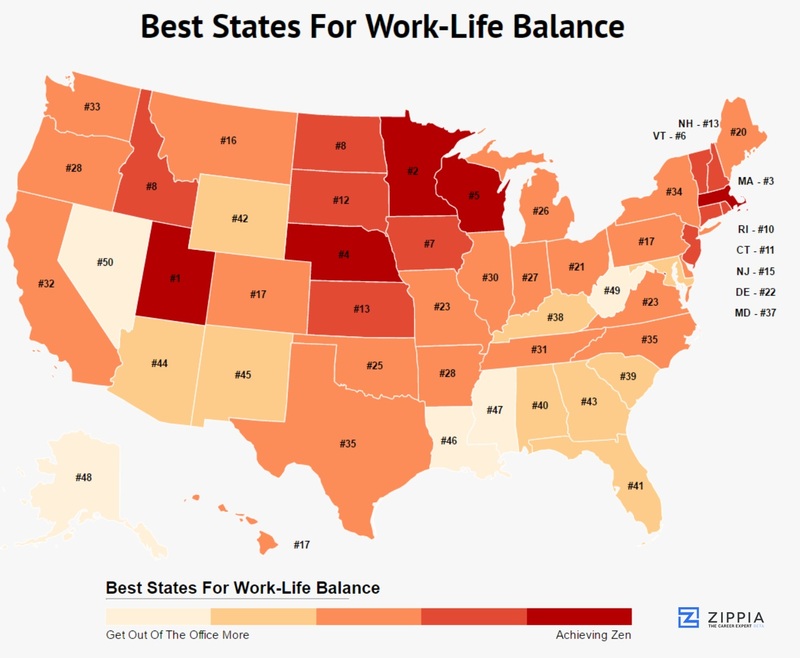 Keep reading to find out just why each of these 10 states has a better work-life balance than yours does. Or don’t; we wouldn’t want you to overwork yourself. You know what they say about the Beehive State: every bee has a good work-life balance. No, no they don’t say that. But maybe “they” should, because residents in this state don’t just have a good work-life balance; they have the best in the country. Why? Glad you asked. It’s because of three factors in particular: 1) Utah residents work the fewest hours on average per week in the country. Just 36.8. And sure, it’s not exactly the most densely-populated of states (like not at all), but who cares—everyone there is already married, it seems (or at least 56 percent of residents—the most in the country), so you’ll always have someone around to hang out with. Plus, the unemployment rate is the seventh lowest in the U.S.! Here’s another state that’s not too densely-populated, but it more than makes up for this, oh, in pretty much every other category. First and foremost, residents here only work an average of 37.9 hours per week. Who needs a 40-hour work week? Okay, who’s surprised to see Massachusetts on this list? C’mon. We all know that residents in this state can get down on work (likely they have to, because of the higher cost of living), but they can also just plain get down. There are so many things to do in this state—as evidenced by the densely-packed population—and with an average of 37.6 hours worked per week, plenty of time to do them. Massachusetts residents are also made up of the most college-grads in the country, which yes, means a lot of hard work—but it also means that when you want to play, you won’t be surrounded by a bunch of half-wits. But that doesn’t mean that residents don’t still enjoy a healthy work-life balance. Case in point: the commute time. At just 18 minutes on average, these guys aren’t dilly-dallying in the car. Instead they’re… well, by the looks of it, working (just 39.1 hours per week, though! ), going to church or meditating or something, or hangin’ with their boo (53 percent are married.) So who says there’s nothing to do in Nebraska? It’s also the land of both work and play for many residents who enjoy a healthy heaping of both. First off, these guys aren’t messing around with intense commutes to work—at just 22 minutes on average, they come in at No. 12 in this category. They also ranked well for their married population—51 percent of folks—and for working fewer than 40 hours per week on average. Keep up the good work! But, you know, don’t work too hard. Fun fact! Did you know that 35 percent of Vermont’s residents are college-educated, making this the 7th most educated state in the country? And did you know that said residents only work an average of 37.6 hours per week? And that the unemployment rate is the 7th lowest in the country?!! Well now you do. This is why Vermont made the cut. Drop the mic. 53 percent of residents here are married, and it has the 10th lowest unemployment rate in the country. So, that’s fun. For those looking for a healthier work-life balance, this state is a gem. (See what we did there? It’s called The Gem State!) Sure, it’s not the most densely-packed state, but hey, that can be relaxing, right? And what better way to spend your time (likely with your spouse, as you know, 56 percent of you guys are married) than to relax, away from it all? You certainly have the time—Idahoans only work 37.9 hours per week! Other factors in its #WINNING – it also has the third lowest unemployment rate and as the second highest number of religious or spiritual residents. Amen to that. Now we jump from one of the least densely-populated states to the second most packed-in state. Pretty much no one is married here (45 percent) and the unemployment rate isn’t great—but residents still manage to work a good 37 hours per week and certainly put in the time to get a college degree—at least 31 percent of them did. Plus, almost 55 percent of Rhode Island residents are religious or spiritual. Ah, balance.